On my way to work I often pass this new Wilmington, NC restaurant: Shucker's. It's an oyster bar and grill, and maybe we'll go visit it soon enough. I just couldn't stop thinking about marketing slogans for them; all of which would be hilarious, of course. "Bring the whole shucking family!" I think that would really get the locals in the doors. I hope you have a great day! "Don't feel like cooking tonight? Shuck it!" It'd get ME through the doors, that's for sure. "career opportunities at shuckers: we've got the right job for you!" Hahaha! Oh my gosh, Steph! That's great! Thanks guys, I'm sure that Shuckers has a job for me. I guess I didn't really need the apostrophe but I added it an now cannot take it back. 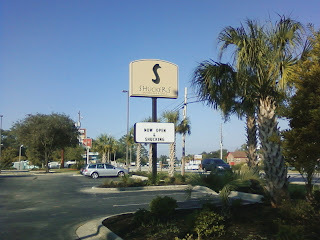 If everyone came to Wilmington I'd treat you guys to a dinner at Shuckers. hahahaha I approve of the proposed tagline. hilarious! Shutterbug, if you don't like oysters, well, they'll probably tell you to "Go shuck yourself!" Hehe. Or maybe not. Fresh caught bass if we're lucky.